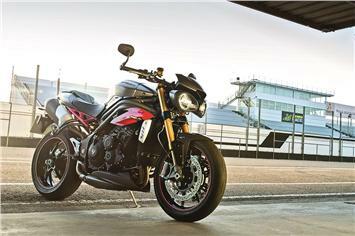 Triumph has revealed two new variants of its litre-class motorcycle, the Speed Triple, called the Speed Triple S and Speed Triple R. Both these motorcycles are developed around a revised 1050cc engine that, according to Triumph, now develops more power and torque. The motorcycle maker says that the new Street Triple S and R‘s engines get 104 enhancements to not only improve power delivery and spread but also to increase efficiency by up to 10 percent, conforming to Euro IV norms. Adding to these, the list includes mechanical changes to the combustion chamber, cylinder head, machined crank, new piston design, slipper clutch, a smaller and more efficient radiator, and it also gets a new free-flowing exhaust. Not only are there hardware changes, but the new bikes also get a new ECU, ride-by-wire throttle bodies, five ride modes – Road, Rain, Sport, Track and a new configurable Rider mode. It also has fully adjustable suspension, customisable ABS and traction control systems and Brembo monoblock callipers. In addition, the Speed Triple R gets carbon-fibre components, fully adjustable Ohlins suspension, trellis subframe, wheel pinstripes, radiator cowls and more premium parts such as the seats.. The bikes get styling changes with the rear more in tune with the Daytona 650R, sleeker body panels and a low and lithe stance. The Speed Triple S gets two paint shades – Phantom Black and Diablo Red – while the Speed Triple R is offered in Crystal White and Matt Graphite.